RUSH: I mentioned the other day that Governor Christie, New Jersey, went on David Letterman’s show, and I just accidentally happened to see it. I turned on the TV, and it was still set to the CBS network for having had the Super Bowl on. I haven’t seen Letterman in ten years. He was wrapping up his interview with Joe Flacco, the winning quarterback of the Super Bowl, and he promoted Christie coming. I said, “Well, I’ll stick around, I’ll watch this. It was a two-parter, I watched the second part. The first part was all fat stuff. Christie comes out, starts eating a doughnut while Letterman’s asking him if he ever thinks about going on a diet. And Christie says, “Yeah, every day.” And Letterman won’t let up. Everything’s fat this, fat this, do you think about food all the time, whatever. Anyway, this has spawned a tremendous amount of concern for Governor Christie and his health. Last night on Anderson Cooper 360 they played part of an interview that Jim Acosta did with a former White House doctor, Dr. Connie Mariano. 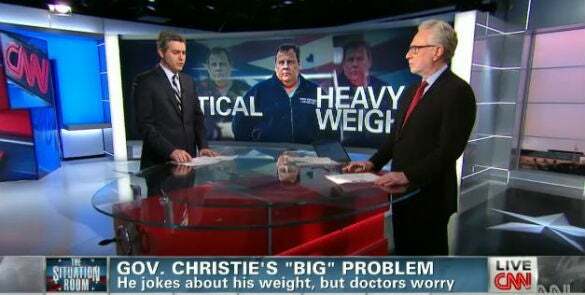 And during the interview a former White House doctor had this to say about Governor Christie. MARIANO: I worry that he may have a heart attack. He may have a stroke. It’s almost like a time bomb waiting to happen unless he addresses those issues before he runs for office. RUSH: Now, he said that his blood sugar was normal. He said he’s the healthiest fat guy that Letterman had ever run into and ever will run into. But a former White House doctor says he’s ticking time bomb out there. You heard it. Well, yesterday in Union Beach, New Jersey, Governor Christie held a press conference about Hurricane Sandy, and he said this about his weight and his ability to govern. CHRISTIE: So far, up to 50 years old, I’ve been remarkably healthy. And, you know, my doctor continues to warn me that my luck is gonna run out relatively soon. So, believe me, it’s something that I’m very conscious of. But in terms of people in the state being concerned about whether or not it prevents me from being able to do my job effectively, I think they’ve seen the results of that. RUSH: Back to CNN this morning, Starting Point, Soledad O’Brien, soon to be moved out of there. You haven’t heard that? Well, she’s gonna be reassigned. They’re taking her out of the morning show. Oh, you must not have heard this. They got ratings information, Snerdley, and it says that — of course every CNN audience is tiny, it’s microscopic, but they dug deep and they found out the vast majority — well, somebody at CNN has denied this, by the way, but it was originally reported that they said her audience, in addition to being microscopic, is too ethnic. It’s like ten black people watching and a couple of Hispanics. Somebody went out there and later denied this, says her audience is too ethnic. So, anyway, they want to move Erin Burnett, and I forget the guy they want, you know, TV wife and husband in there. I forget who the guy is they want to put in there, but they want to move Erin Burnett. She’s contractually committed to her seven o’clock show, and I don’t think she wants to move. So she could hold ’em. COHEN: That’s true. However, you’re healthier than him because you are thin. Just being heavy — even if your blood pressure is normal, even if your cholesterol is low — does still put you at a higher risk of having a heart attack or stroke. E-e-even though his blood pressure, et cetera, might be fine now, they might not be fine in the future. We do have some data that looks like the morbidly obese and what their life expectancy is. People who are morbidly obese, it cuts eight-to-ten years off their life expectancy. So for a man it’s about 76. So it would cut it down to, let’s say, about 66. There’s people at both ends of the spectrum, comparable to the effects of smoking. RUSH: These people have all got Chris Christie dead and buried. He’s already gone. It’s just a matter of time, as though he’s the only person in America who’s ever going to die. But they’ve got him in the grave. It’s over, a fait accompli, done. Nothing he can do about it! Well, he can… (interruption) Well, I think there is a lot of concern because Governor Christie has shown signs of promise as far as the Drive-Bys are concerned. He’s not nearly the strident conservative that people thought he was, and he never really was conservative, by the way. But because he took on the unions and took on some spending, he conveyed that he was very conservative, but he’s come out. STEPHANOPOULOS: That did work for Mike Huckabee when he was running for president, but he will. Even, he knows it, too. If he wants to run, he’s gonna have to lose some real weight. ROBACH: M’yeah. He’s gonna have to lay off the doughnuts. RUSH: Yeah, he’s gonna have to lose some weight. “He’s going to have to lay off the doughnuts.” It’s a fait accompli. He can’t run if he doesn’t lose weight. Well, he only got elected governor as he is and he’s only got a 70% approval rating as he is. (interruption) Well, we have had fat presidents before but not in the modern era. The one thing Christie’s got going for him, is the one thing that we’ll never have is a bald president. You’re never gonna have a successful bald TV anchor and you’re never gonna have a bald president. In the TV era, if you don’t have a 14-inch part in your hair, you don’t have a future in television or presidential politics. That’s why Bite Me doesn’t have a prayer when you get down to brass tacks. He doesn’t have a prayer. Not only does he not have a 14-inch part, he’s got plugs. He doesn’t have a part in his hair, and for TV info guys, I mean, you might have local and tertiary weekend anchors, but I’m talking about the big guns. Unless you have Ken Doll kind of hair, it’s over before you even start. RUSH: Okay, I’m being inundated with e-mail from people. “Hey, wait a minute, Rush! If they’re gonna say that Christie’s life expectancy/lifespan is gonna be shortened ten years just the same as it is for smokers, why don’t you talk about Obama? He smokes!” I woulda mentioned it. I thought Obama quit. Isn’t that the news that they put out, that Obama quit smoking? If he hasn’t, if he’s still smoking on the sly, then you’d have to say the same thing would apply to Obama as the weight thing applies to Governor Christie. My question is: If you have a White House doctor who calls you “a time bomb waiting to happen,” can Obama kill you with a drone? You never know the way things are happening. You know, Obama could only hear half of what’s said when somebody says, “Christie’s a time bomb waiting to happen,” and that could be a red flag for him to launch a drone.